Our Aubrey veterinary hospital is devoted to your pet’s wellbeing. We provide a variety of veterinary medical services for small animals in Aubrey, Texas and surrounding areas. 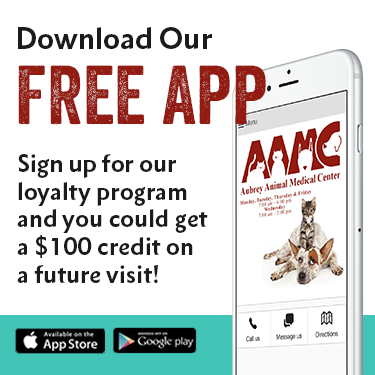 Aubrey Animal Medical Center is located approximately 5 miles north of Highway 380 on Highway 377. We are conveniently accessible to Pilot Point, Aubrey, Crossroads, Providence Village, Savannah, Oak Point and Little Elm. If you are unable to stop by during business hours for an appointment, please call our office. Many clients find it very convenient to drop-off early and leave their pet for the day. Pets are treated throughout the day and are ready for pick up in the afternoon. This prevents missed hours at work and makes it easy for pets to be treated. There is no extra charge for drop-off appointments!